Tuesday’s snow has been cleared, the roof has been raked and we got up around 30°F today which led to some melting. Around midnight tonight there’s another few inches coming in and then we get real cold again, just in time for the weekend. I am actually starting to enjoy the cold. So here is one of my summer favorites. I haven’t posted an insect in a while and I think we all like dragonflies. Clamp-tipped Emerald-Somatochlora tenebrosa. Another example of not having to go anywhere, this was in my backyard a few years back. 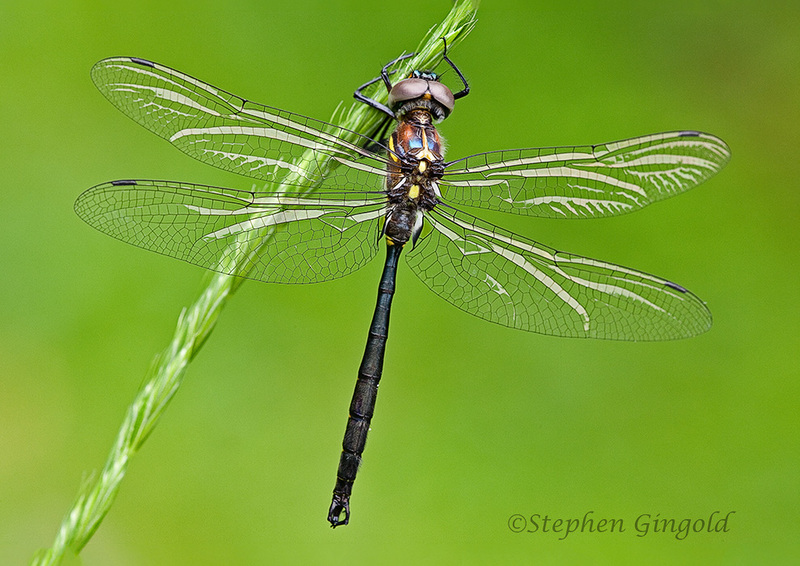 This entry was posted in Closeup Photography, Insects, Nature Photography and tagged backyard photography, Clamp-tipped Emerald, dragonfly, insects, odonata, Odonate, Somatochlora tenebrosa. Bookmark the permalink. That is a fine specimen. And, the green is rich and alive. Remarkable how those delicate wings are formed and can last so long. Superb flyers. I would love to have seen one of those huge ones from the dinosaur era. They look so delicate but are so fierce. I imagine one of those huge prehistoric odes might have been able to fly off with you. Steve, as far as bugs go I like dragonflies, lady bugs, butterflies and bees.Maybe a few more that I can’t think of now. I like this spring-summer photo very much.,I always have dragonflies hovering around my butterfly patch and I’m assuming because of the extra water and what ever other bugs that particular area attracts. I seldom see them hang around in drier spots. Bugs are much more important to life on the planet than most people realize and certainly contribute more to an ecosystem than we humans. I am glad you enjoyed this little reminder of warmer days, Yvonne. Wow! So gorgeous . . . I, too, am dreaming of summer! Thanks, Laura. It’s hard not to think of summer right now in the midst of cold and snow. That green in the upper right-hand corner is almost exactly the green of the room I’m sitting in. Yellow, green and white in combination always put me in mind of spring. The dragonfly’s beautiful. I had no idea there were big ones a few eras back. I looked them up, and found one article that mentioned a two-and-a-half foot wingspan. Impressive. I wonder if they made a lot of noise when they flew. So you painted your room to look like my backyard? Good choice. I bet they did make a loud sound with those stiff wings, considering the noise the”small” ones make. A beautiful capture…such delicate wings. Thanks, Beth. The wings do present a powerful delicacy. This is a beauty, Steve and gives us all something to look forward to. Thanks for the nice warm comment, Andrew. You mean that’s not a picture from January in Massachusetts? Darn… or better darning needle, as we used to call them when I was growing up. The scientific name Somatochlora tenebrosa means ‘shadowy green-body’ but “raking the roof” will be Greek to a lot of people. Yeah, remember darning needles, but those are damselflies. It’s foreign to my wishes raking a roof. But a few years back we had ice dams form which, for anyone who is unfamiliar, happen when the snow at the edge of your roof melts and then freezes, not allowing the upper melt to flow off the roof. It backs up which then causes it to seep under the shingles. When that happens it can leak into the house which is just what happened here in my study and just missed the computer. So rake I will. As fun as it does not sound, it’s even less so when we have gale force winds while I rake. Ice melt leaking into your house sounds like no fun at all, so I understand your raking the roof. At our previous house the pitch of the roof was shallow enough that I never hesitated to get up there and sweep out the troughs from time to time. The roof on our current house, though, is steeper, and I decided not to try to go up there. Prudence is the better part of valor in this case. I am fortunate that we live in a one storey home with a modest pitch, but I will not go up there just the same. Heights and I do not get along. I will climb a ladder to clear the gutters of leaves and debris, but that’s about my limit. Ah, I had visions of you up there, but you took a prudent approach too. Yup. A roof rake is @12 feet long so I can work while grounded. Thinking of summer as we pack for Mexico. Dragon flies are such a favourite. Except when you see them take a butterfly right out of the air with a loud snap. Some dragonflies do as you and migrate south, Rod. Maybe some of ours will be there to greet you when you land. Yeah, there’s eaters and eatees. We don’t like it when the cute eatees get eaten. Nature does not know cute. The photo is like a breath of fresh air … as we await sub-zero temperatures and MORE snow over the next week or so. Beautiful shot. Razor sharp … which is something that I always appreciate. Beautiful colors. Thanks. We are anticipating the same weather. After it leaves you it comes to us. Tomorrow morning is to be around 0°F at sunup with strong winds gusting into the 30 mph range. It’s 50/50 whether I go out or not. Mary Beth suggests that I don’t and I am inclined to agree but it will be a “game time” decision.